It’s funny, these things of God. They are usually simple, and yet also totally complex. Take for instance, joy. Who doesn’t like joy? Who doesn’t want to be joyful? But on the other hand, joy? Really? It’s a good thing, yes. But there are serious things in this world. Serious issues and serious needs, serious plans and serious pain. Is it even ok to be joyful? Like many things in God’s Kingdom, joy is complex… Joy can look so uniquely different to each person. What does joy look like to you? What comes to mind when you think of joy? To me, off the top of my head, joy is the sweet smiles and piercing giggles of glee from my boys. It’s catching a glimpse of a mountain, with a sunset behind it, and a person standing on the very top. Joy is the feeling in my chest when you walk in the room, and I get to hug you. Joy is the swirl of creamer as it sinks into the beautiful brown coffee in my favorite cup. These are the things that come right to mind when I think of joy. What about you? I am 100% confident, though, that I don’t even scratch the surface when it comes to understanding joy. I believe joy is a deep, layered mystery. An important mystery. As a word, it’s mentioned in the Bible hundreds of times – it’s a reaction, a command, an attribute of God, a thing, a feeling... The Bible has an awful lot to say about joy. My favorites are where it says that the joy of the Lord is our strength and in God’s Presence is fullness of Joy - how cool is that? There are so many layers to this joy thing. The more I look into it, the more I feel the invitation to dive in even deeper. So this Advent Season, let’s take time for joy. As we pause and make room for Jesus in our hearts, He can’t help but talk to us about joy! His birth was announced with joy, He endured the cross for the joy set before Him, and He gave us the Holy Spirit, who’s Presence produces joy. Joy. Serious joy. The mystery of joy, the strength of joy, the certainty of joy, and yes, maybe even the dancing silly giggles of joy! Let serious joy meet you this season, wherever you find yourself. In grief, let joy be a silent but strong arm to lean on. Or in celebration, let joy join you on the dance floor. Because joy isn’t one thing or the other. Joy is the affirmation that love wins, joy is a part of God that is beyond our understanding… except that we can trust it and it is good. Joy is not an expectation, a manufactured feeling, or a performance. Importantly, joy isn’t up to us. Joy was God’s idea. I’ll close with a spoken word piece that really resonates with my heart and expresses way more eloquently than I what I am trying to say. Also if you’re feeling inspired to dig into the mysteries of serious joy, there’s a list of some scriptures I have been sitting in this week to get your thoughts going! To close, I pray for us all, that we each get blessed with a new layer of serious joy this Christmas that meets us with open arms right where we are. What does joy look like? Does it dress itself in wonder? Does it cower in defeat? Is it hopes and dreams newly kindled? The toothless smile eclipsed on the tender visage of a newborn? Is it born out of moment or is it a discipline? Does it ebb and flow between conscious thanksgiving and quiet reverence? Do not be grieved for the joy of the lord is your strength. What happens when grief is not compatible with joy? What if my pain doesn’t echo the melodies within a praise song? What if my heart is too preoccupied with its rupture to see the Father beckoning still? Joy is not the absence of pain. Laced with purpose, joy infuses the most broken of futures and claims, however incredulous, there is a good and expected end. Joy is the Father’s love song to the narrow crevices, the deepest cavities our soul. 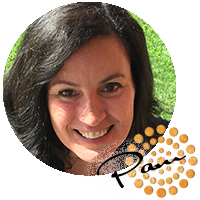 Pam is a fun and encouraging team-builder that brings the best to those around her. She loves people and is committed to serving and mentoring kids, women and families with opportunities to grow closer to God and each other. Pam is currently serving as Children and Family Pastor at Valley Christian Center in Albany. Pam and her husband, Jared, have been married since 2005 and have three boys. Their family will always be a much loved part of our CitySalt family.